As the age of the 35mm camera draws rapidly to a close, it is at last possible to provide the definitive answer to one of the pressing questions of our time: which manufacturer offered the largest number of different prime focal lengths for a 35 SLR lens mount in the bread-and-butter, near-normal range from 24 to 85mm? The answer, unearthed by the T.O.P. Special Investigative Unit: Pentax. The changeover from M42 screw to K bayonet in 1975 came too late for Pentax to regain the market leadership it had enjoyed in the early days of the Japanese SLR boom. But perhaps in compensation, it marked the beginning of a wave of hair-splitting optical creativity that continues to delight loony-fringe connoisseurs of the prime optic to this day. 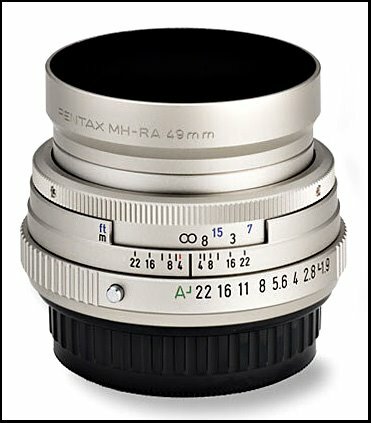 All told, Pentax has offered a total of eleven different focal lengths in K bayonet within the near-normal range: 24, 28, 30, 31, 35, 40, 43, 50, 55, 77 and 85. Of these, 30, 31, 43 and 77 are unique to Pentax. The runner-up? Nikon, with nine, none unique to the brand: 24, 28, 35, 45, 50, 55, 58, 60 and 85. UPDATE: Speaking of the early days of the Japanese SLR boom, commenter 01af reminds us that two other venerable 35 SLR lens mounts share runner-up honors with the Nikon F bayonet: Minolta SR (24, 28, 35, 45, 50, 53, 55, 58, 85) and Konica AR (24, 28, 35, 40, 50, 52, 57, 58, 85, with 52 and 57 apparently unique to Konica). Alas, we must reduce Pentax's bragging rights as well. TOPSIU is indebted to Captain Jack's Exakta Pages for documenting a couple of other 30mm lenses, both in Exakta mount: the Rodenstock 30mm f/2.8 Auto Eurygon, and the Meyer Optik 30mm f/3.5 Lydith. 30mm is not unique to Pentax, as Sigma has a 30mm f/1.4 reduced image circle lens for APS-C DSLRs. 24 mm, 28 mm, 35 mm, 45 mm, 50 mm, 53 mm, 55 mm, 58 mm, 85 mm. 24 mm, 28 mm, 35 mm, 40 mm, 50 mm, 52 mm, 57 mm, 58 mm, 85 mm. Three of these focal lengths are pretty odd and seem unique to the respective maker (53 mm to Minolta; 52 mm and 57 mm to Konica). Thanks for the additional info - I will post an update. You're right, of course, these focal lengths are nominal only. There's a fair degree of slop in how the vendors choose to label them, relative to the actual FL. That's an interesting marketing story in its own right. 53 is not unique to Minolta, however - apparently there was a 53 for a couple of Topcon mount variants. Yes, "prime" lens is just another way of saying fixed-focal-length. I'll do a little post about it later. "...loony finge" LOONY FRINGE! Listen bud, I figure when I get too lazy to change a lens, it's time to set fire to the darkroom, through the camera in the sound and just go home and sulk. Honestly now, not all prime users are looneys (or even..snobs). Good fast zooms cost big bucks and are a literal pain in the neck. Good fast primes are a compartive pittance in price and grams. Besides, you only need 2 or 3 stuffed in the pocket of a small photo vest and your good to go. Picking nits here, but you missed the Nikon 80mm (made briefly for the F3AF). Pentax has one more unusual focal length - 83mm. This was a screw mount lens....Also Canon had a 58mm f1.2 for their first series of SLR's..so Minolta and Konica weren't alone in that focal length.